A clinician friend of mine likes to joke: “general family practitioners know nothing about everything, and clinical specialists know everything about nothing.” All joking aside, the complementary nature of the generalist/specialist model is still needed in healthcare today, now more than ever, and there is tremendous pressure to make it work more seamlessly. However, as health IT advisors, we need to better enable this model, especially when we consider the inherent complexity of the healthcare system, and complex patients specifically. For most of us, gone are the days when your family doctor visited you at home and was responsible for all of your healthcare needs. Today, if you're going to interact with the healthcare system, chances are you and/or your family doctor are going to interface with multiple people, across multiple care settings. This is one of the reasons our healthcare system is so fragmented and complex –often driving waste and inefficiency. It's also one of the reasons why it's so difficult for the healthcare system to have a single, holistic-view of the patient's health information at any one time. They have multiple chronic illnesses and associated complications. Complex patients have multiple treatments and/or procedures, therapies, and prescriptions. They often have a peculiar combination of resiliency and fragility, and they also tend to have unexpected responses to common medications and minor illnesses. They are becoming more prevalent. As the population becomes older, the number of complex patients is increasing, and the need for services for them is increasing. When a complex patient interacts with a complex healthcare system, not only is there a potential for increase waste and inefficiency, but patient safety becomes a concern too. 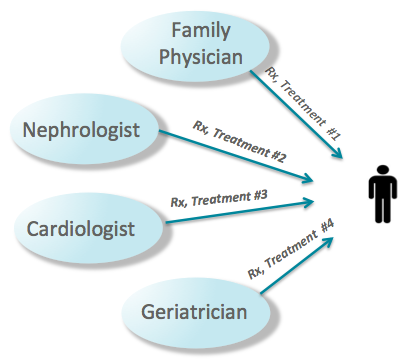 As illustrated in this diagram, a complex patient may be referred to several providers or specialists. Under many circumstances individual providers, including the primary care physician, may not be immediately aware of all the detailed testing, treatments, prescriptions and actions being taken by other providers for the same patient. In effect, the patient is receiving multiple care plans from the healthcare system. 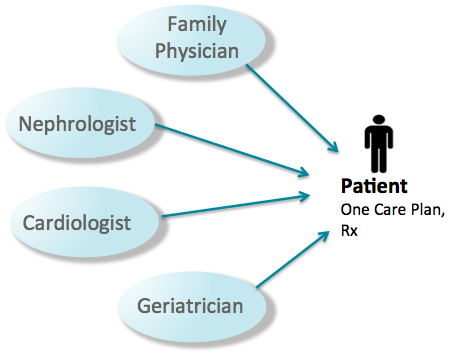 An obvious solution to the systemic problems identified above would be to have a single integrated patient care plan for each patient as illustrated here. Notwithstanding that each provider may in fact already be creating their own patient-centric care plan, what's needed however, is one patient-centric care plan that is representative, collaborative, and compatible with all associated providers within the health system for a selected patient. This information would come together to form an integrated, multidisciplinary care plan, facilitated by a health support coordinator. The value proposition for collaborative care, especially as it relates to complex patients is strong for providers, payers and patients – everyone wins. In fact, many health organizations are now implementing different technology and business solutions to make this concept a reality. However, many solutions that the health IT industry has proposed, although directionally correct, don't go far enough to provide enough value for the providers or resolve the majority of systemic problems of this model. As a result, the risk of low adoption and ultimate failure becomes more prevalent. Information Continuity. This is the availability of all relevant, past and present patient information to help make provider care decisions fully informed and more appropriate. This usually means that the solution is able to take advantage of information acquisition form disparate data sources, including other providers and aggregate the information for viewing at the point of care, in a timely fashion. Patient Care Plan Continuity. This includes the collaboration between providers to rationalize multiple treatment plans into a single compatible, coherent plan and to manage health conditions in a way that is responsive to a patient's overall changing needs. This often means that the solution is able to provide electronic forms, clinical documentation, and electronic communications to allow providers to collaborate on a single patient care plan, with the support of a care coordinator. Patient Continuity. This covers the patient participation in their care plan as well as the way they experience health services. The ideal solution is able to support patient access to their care plan and other related information through a patient portal or through printed report with the support of a care coordinator. The solution also enables ongoing patient feedback and communications on the progress of their treatment. When considering a solution for delivering healthcare services to complex patients across multiple care settings, ensure strategic eHealth considerations include the suggested collaborative care continuity imperatives.